Dadex CC Sewer Pipes are ideal for disposal of domestic town mix or industrial sewage. 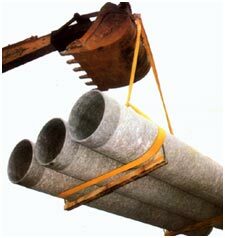 They are also used as jacket pipes and cable pipes for drains. Special internal/external coated Dadex sewer pipes are also supplied for specific requests. 80, 90, 100, 150, 200, 250, 300, 400, 450, 500, 600, 700, 800, 900 and 1000mm in 4m length. Standard length is 4 m.